Butler’s Austin Greaser eyes a putt during the OHSAA Southwest District Division I golf tournament at Beavercreek Golf Club on Thursday. BEAVERCREEK — Butler golf standout Austin Greaser has earned his second straight trip to the Ohio High School Athletic Association State golf tournament. Playing a difficult course in windy conditions, Greaser finished in a four way tie for second after shooting a 74 at Beavercreek Golf Club. During a four-man playoff for three spots, Greaser made par on hole 10 to join Troy’s Holden Scribner and Carroll’s Tyler Goecke as the three individual qualifiers. Lakota East, Mason, and St. Xavier were the three team qualifiers. After an early bogey, Greaser carded six straight pars before birdying his ninth hole, #18. After turning at even par, he went to one under after a birdie on hole #2. He then hit a rough patch and bogeyed three of five holes to go to two over par with two holes to play. He then parred the last two holes to force the playoff. He said that although the play off was “a little nerve racking” his experience in playoffs was a help. 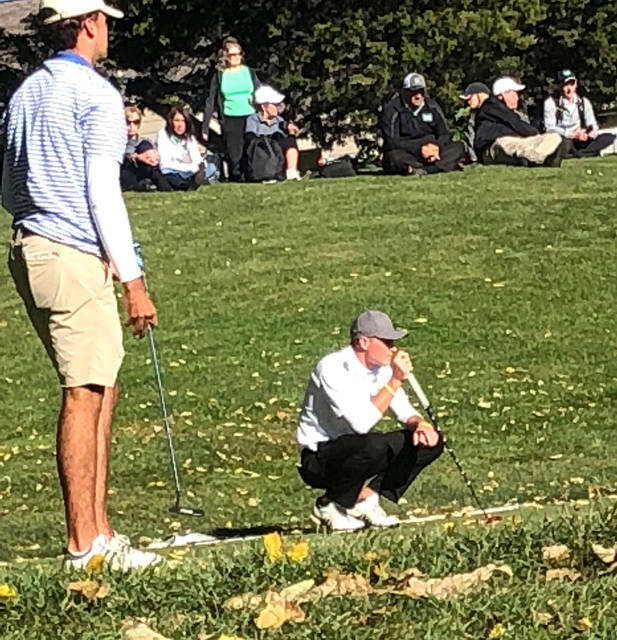 Greaser looks to improve on his performance at State a year ago where he shot a 78 on the first day and rebounded with a 71 on the second day to finish fifth overall. The OHSAA Division I boys golf tournament will be held October 19-20 on Ohio State University’s Scarlet Golf Course.